You don't have to be invited to enter but you do have to promote the event by getting another player to join up to save the �25. No Handicaps, all tables clothed and re cushioned there will be NO EXCUSES. There will be those players who talk a good game but will decline this event as they simply are not good enough to compete with the best amateurs the UK has to offer � for the rest there is JUDGEMENT DAY � WHO IS CUE FOR CUE THE BEST amateur in the UK? ONE OPPORTUNITY� get it right and you will be REWARDED� but get it wrong and you�re going HOME!!!! T9B 100% committed to bring quality events time after time. Remember you only save if your invited player enters. So promote and ask someone to come with you to save money and increase the prize fund. Everyone saves if 32 players are reached and paid. ur a bad man u are luggsy ya ninja!!! whos the gb9 pro then ollie ya bell??? Thanks wildman147 for clearing this us as it reads a little miss leading. Good luck with the event, I'd have had ago myself but I'm playikg in the national ciu semi the same night. Come on guys over half the field full in just a couple of days. 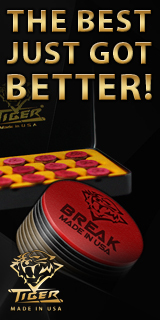 The new T9B goes live today at www.total9ball.com all players not rated A* are eligable for this awesome event. get your names down. A great reponse to this event so far. 23 players have entered 5 have already paid there entry. There are just 9 spaces remaining. I notice some players havent accrued the the �25 saving yet. Just promote to player... if one says they want to come send me a message and il change your entry fee. impressive hey... seen a better 9ball one day event fund? get promoting, save yourself some money and increase the pot. Just 9 spaces remaining. Snap them up. You know on the day you will wish you were playing. Ok payments required by the latest of 10th November guys. 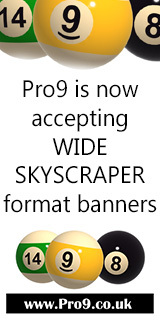 We need commited players. We may have a sponsor to boost the pot a little TBC. We need to get match times sorted ect so lets get paid up so a draw can be done. pm wildman147 for details ormessage myself or Mark Parker on facebook. Page took 0.043502 seconds to load.